I don't know about you but ever since I saw the first China Glaze Capitol Colours promo pics, I've been really excited to see them in real life. Today I have 2 of them for review, Riveting and Luxe and Lush. 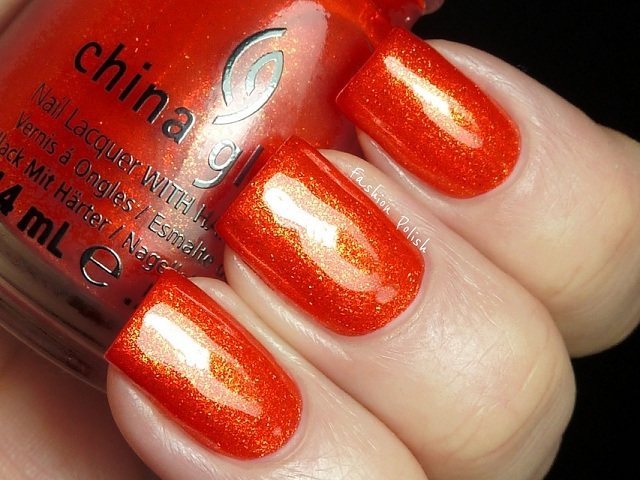 Riveting is a very bold orange packed with orange and gold flat shimmer flecks. It's very bright and saturated, like blazzing fire on the nails. Formula was amazing too : very smooth, even and pigmented on the fisrt coat, perfect on the second. It wasn't one of my firt picks from the collection but definitely a win. Luxe and Lush is a very unsual flakie topcoat. 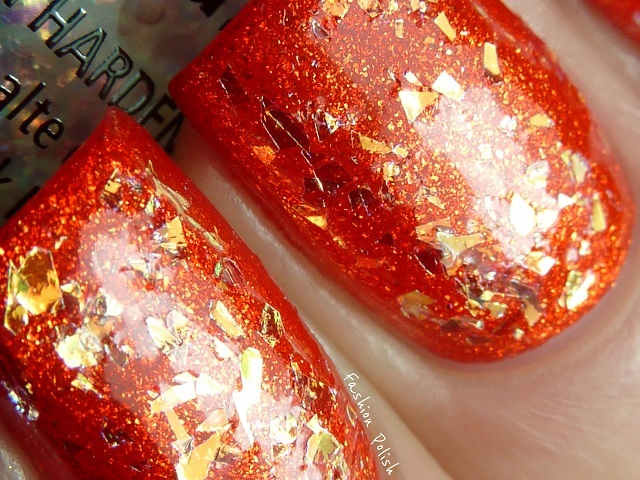 Not your typical flakies but more a mix of flat, irregularly shaped, mylar flakes like the ones you can buy loose for nail art. It sparkles blue, purple, pink, gold, green... Very versatile. Over Riveting, it mainly flashes gold and over China Glaze Pelican Grey it almost reveals its entire spectrum. Formula was a bit goopy but very manageable. 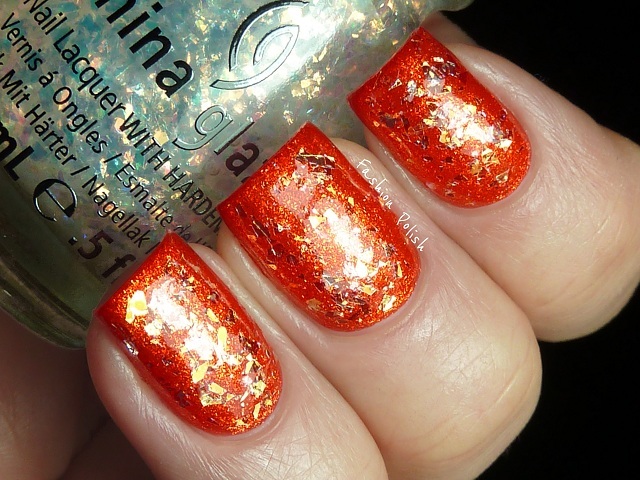 China Glaze® Capitol Colours will be available in early March 2012 atsalons and specialty beauty retailers including Sally Beauty Supply and ULTA stores, coinciding with the release of THE HUNGER GAMES in theatres March 23,2012. Individual shades retail for $7. The collection will be available in a 12-piece counter display as well as open stock colors. China Glaze® is free of DBP, toluene, and added formaldehyde. China Glaze®nail lacquers are available through salons and professional beauty supplystores nationwide. 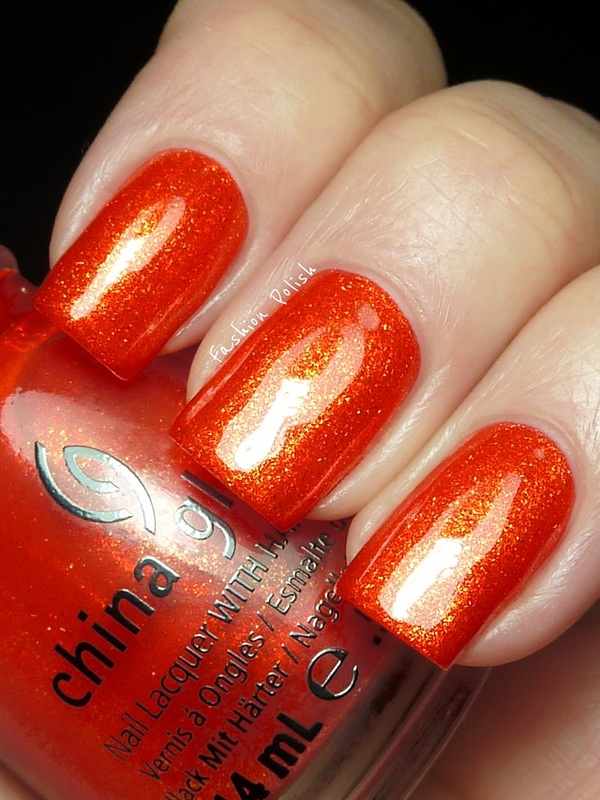 For more information, visit: www.chinaglaze.com or follow China Glaze on Facebook and Twitter. 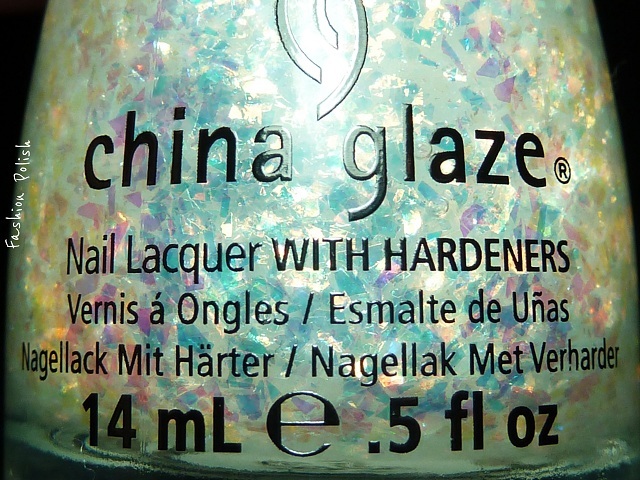 China Glaze®is a division of American International Industries. You swatches of these two are AMAZING! Mmmmm!! I cannot wait to try these! I am being so lazy with my swatches, lol. My eyes are bugged out and my mouth is drooling. Must.Get. Oooh, I love Luxe and Lush - especially over the light blue. Reminds me of icicles somehow! aaaaah these are the TWO THAT I REALLY REALLY WANT!! Wow, Luxe and Lush is really beautiful over the gray. I gotta get Riveting. It looks to be one of those colors that will look good on everyone. absolutely stunning.. those close ups are to die for! Every time I see a swatch of Riveting, I know I've got to have it! 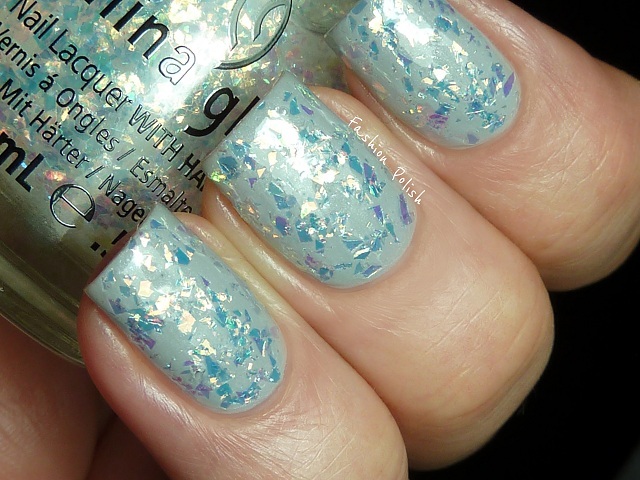 Ahh, Riveting is now still my pick of the litter, gorgeous - and Luxe and Lush I think i "need" too, thanks for sharing!! So pretty! 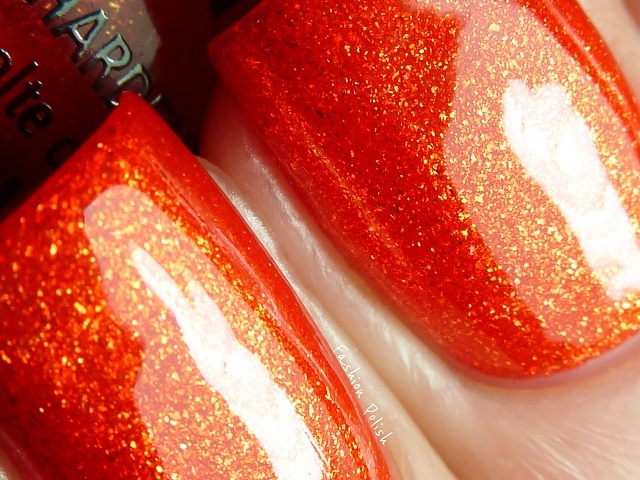 Riveting is the best orange polish. What a good match over Pelican Grey! Now I know i must have that flakie! very pretty polishes! I love them!! I got into bright true orange (not Halloween orange)after some pales right after Xmas colors. I am crazy for these great oranges coming out. Riviting will be on my must have list. Love the fire inside it. Also adore this new topper. Cannot wait for this collection to hit Sally's. Hopefully we will get them in before the end of March in my area that tends to be really slow, only getting shipments ever 2 weeks. Great minds must think like lol. I was wearing Riveting and Luxe and Lush just yesterday. I love Riveting so much!!! Wow! Riveting is gorgeous!!! Beautiful swatches. I am SO excited about this collection! I basically want all of them. Riveting is so gorgeous! Riveting looks amazing and I love how Luxe and Lush looks over both polishes. I actually have a friend who is going to pick up the whole collection for me at CosmoProf and I can't wait to get them! There are so many colors that aren't your usual shades. China Glaze really knocked it out of the park with this one in my opinion. I can't think of anything original to say - these are ridiculously stunning!! I have had the same issues with it!! !